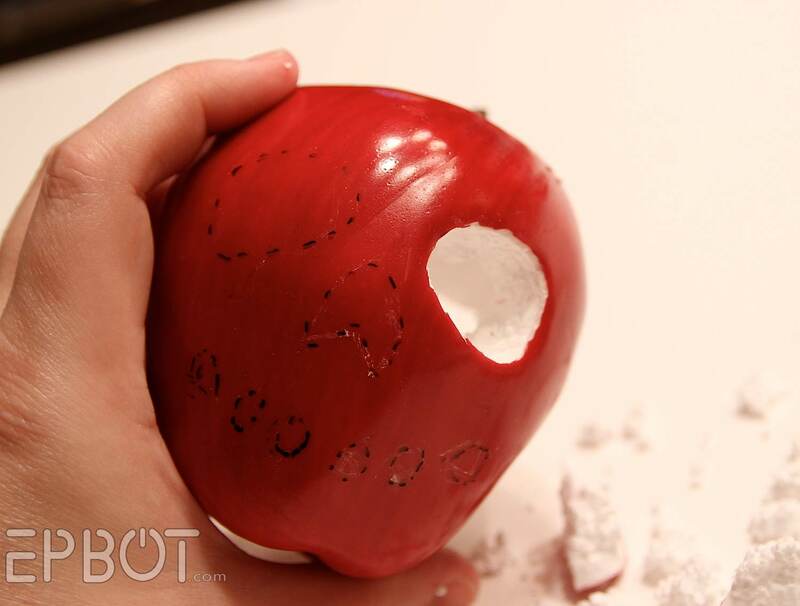 EPBOT: Halloween DIY: Make A Glowing Poison Apple for Less Than $3! 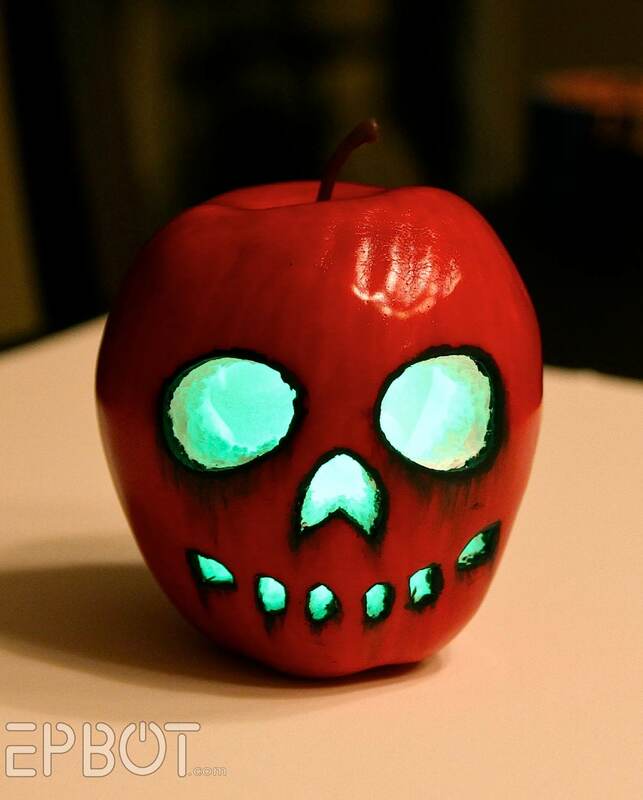 Halloween DIY: Make A Glowing Poison Apple for Less Than $3! 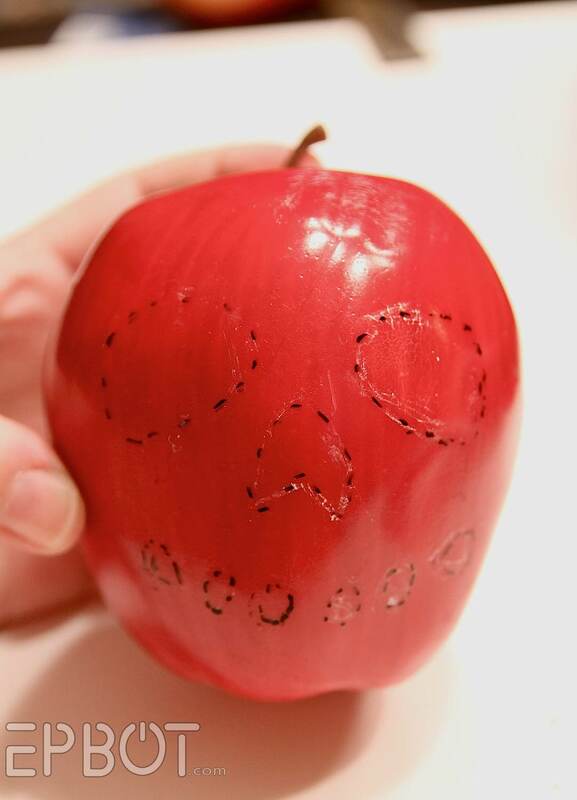 Here's a quick craft you can make in about an hour, and for less than $3! 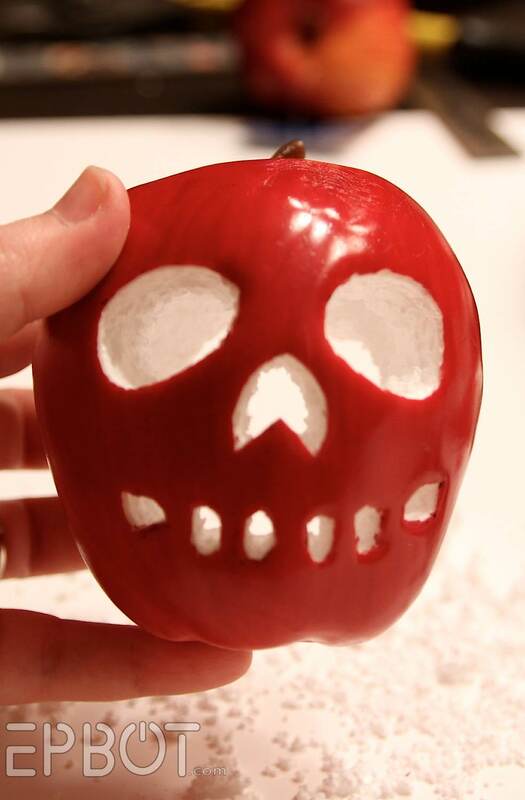 It's perfect for Snow White costumes, any kind of witch or fairy tale baddie, or just decorating the ol' fruit bowl. I used a photo of a skull for reference, which helped with the eye shapes especially. 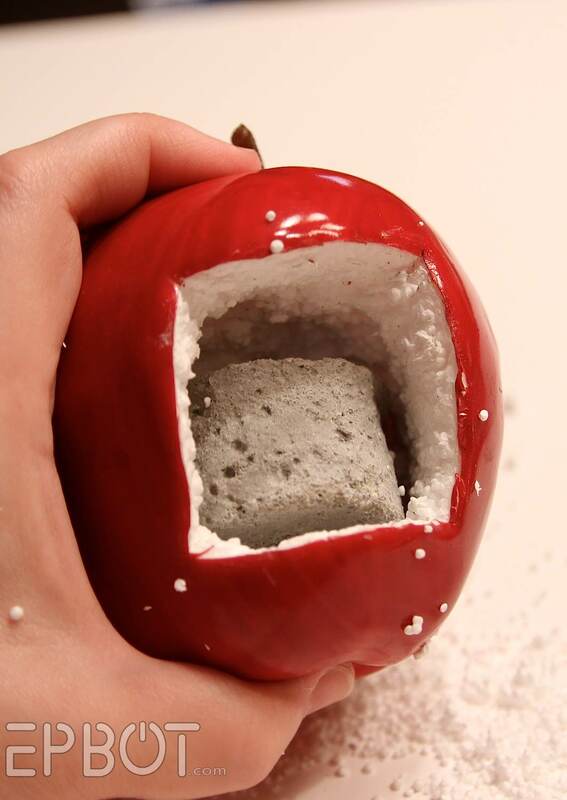 On the opposite side of the apple, cut out a square "access hatch." Keep it all in one piece, and make it at least this size. You'll see why in a sec. I recommend a fine-tipped blade for this, and cutting up & down in a sawing motion makes the curves easier. 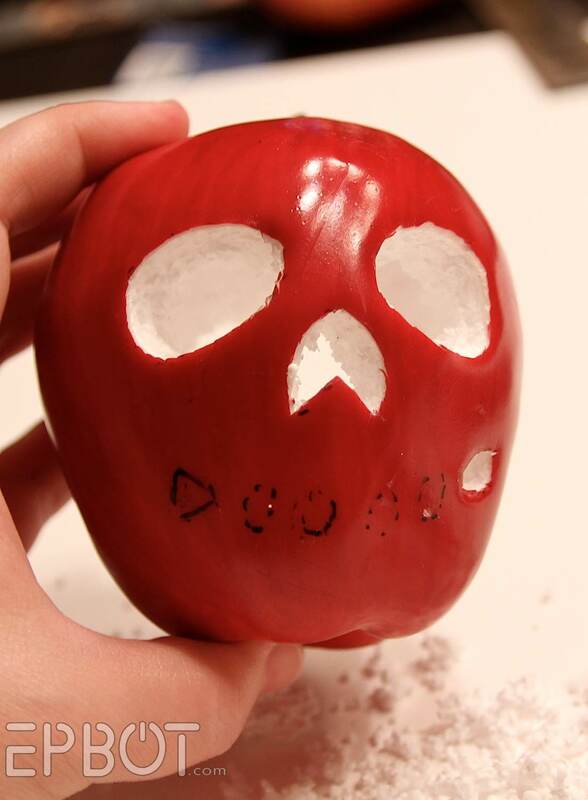 I eventually figured out you can make smoother cuts by just slicing the apple "skin" first, and peeling that off. Then cut out the rest of the foam. I only painted a little ways inside the cuts, so there'd be more white left to reflect the glow, but feel free to paint the whole inner edge black, if you like. You could use a small LED to light your apple, of course, but after comparing a green LED to a green glow bracelet, I actually prefer the bracelet! It's more diffused, and it looks better in photos - while still being surprisingly bright. In fact, it's so bright the green is washed out in my photos, but trust me: it's REALLY green. 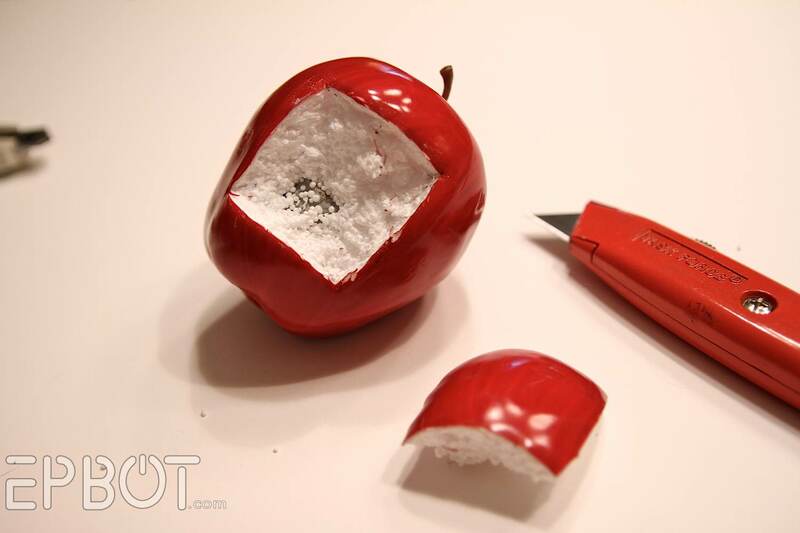 Wrap your glow bracelet in a scrap of tissue before stuffing it in the apple; it'll help hide it, and also diffuse the light more. Pop the access hatch back in place (it should hold, but if not, use some clear tape), and you're good to go! This is brilliant. I love it. Thank you! I needed another decoration for my library's Teen Tales of Terror night. This will do nicely. Mwahahaha! This is so cute! Well, it's creepy, but in a cute way. 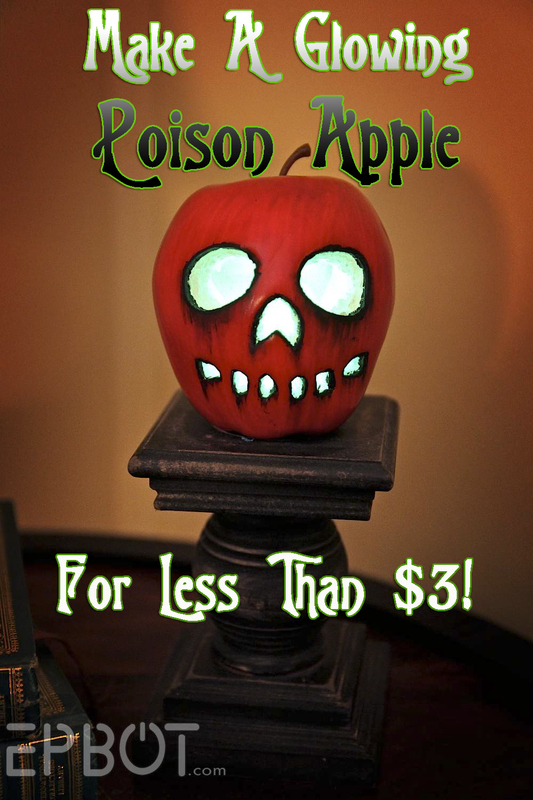 I love that the bright, artificial redness of the fake apple really works for the poison apple. My 18lb purring monstrosity always has to make sure my crafts have enough cat hair on them, so I understand your pain. I love it! Makes me wish it was still part of my job description to decorate stately homes for Halloween tours!! This is awesome. I bet you could do a whole bunch of different fruits and veg, then make a creepy Swedish chef outfit. This is awesome! 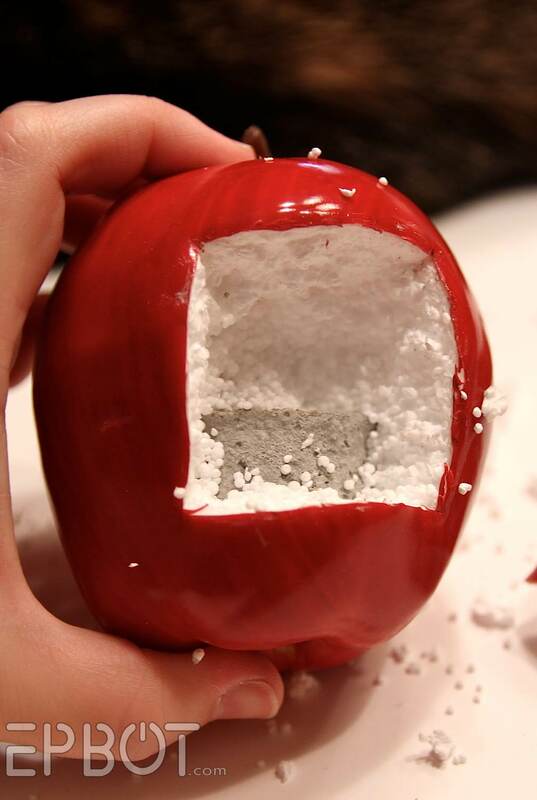 :) Not gonna lie, you made me nervous with that gaping hole in the back of the apple. Thanks for clarifying. 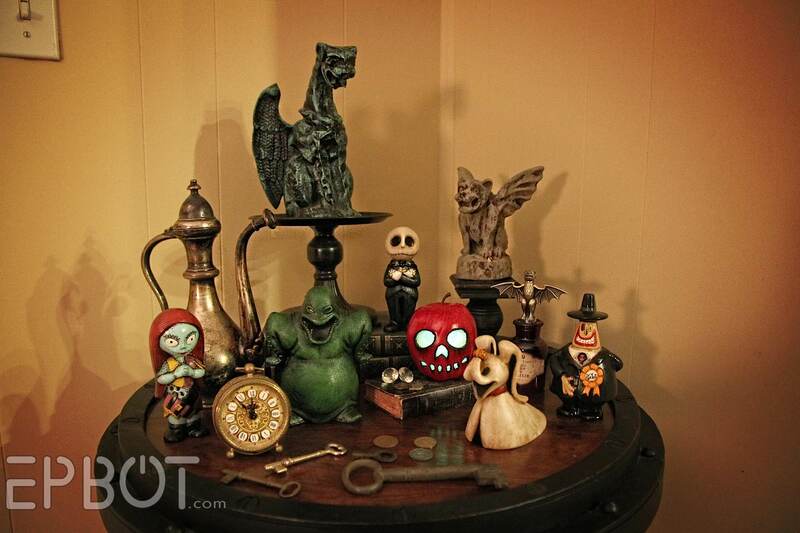 By the way, I may have to find exactly how to recreate your Nightmare Before Christmas display. You've posted about it before, and I'm still insanely jealous. 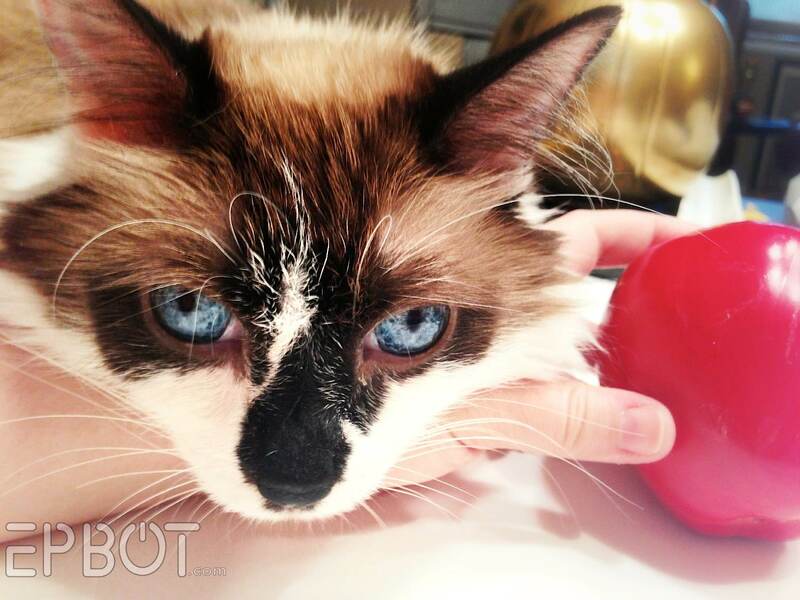 That 'Zero' is just so ghostly adorable. Tesha, I had to go back and watch to make sure (oh no, not the briar patch!) but it actually IS a pumpkin. A little jack o'lantern nose that glows very bright (which obscures the pumpkin like features most of the time). 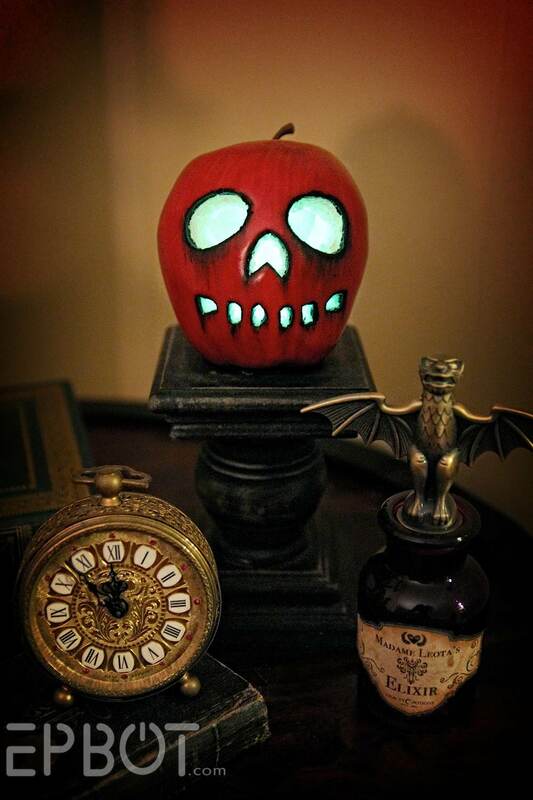 I think I'm going to try that with a fake pumpkin to put out on my front porch, because that looks awesome. It's so beautiful... I mean, spooky... I mean,... You know what I mean. helping" but supervising!!! Plus how silly cats look when covered with stryofoam!! 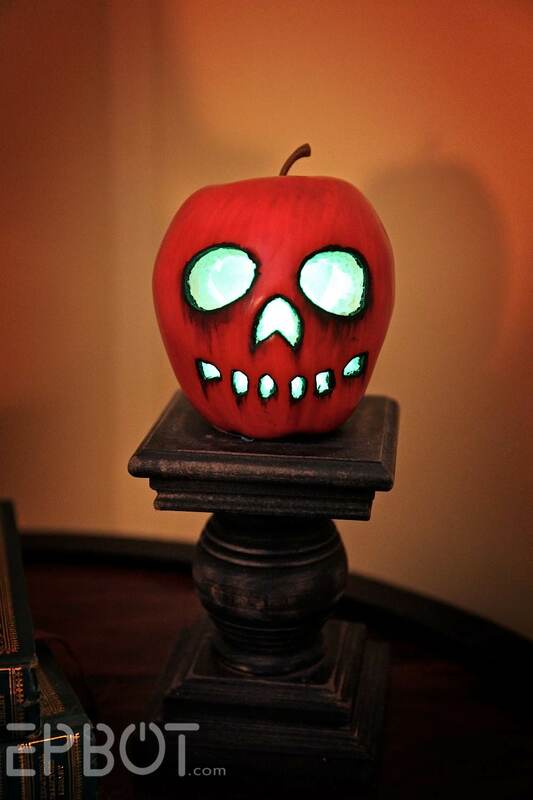 If small pumpkins are available, this would be perfect for Green Goblin cosplay. What a fun spooky craft! Also your friend Christie looks amazing!!!!! 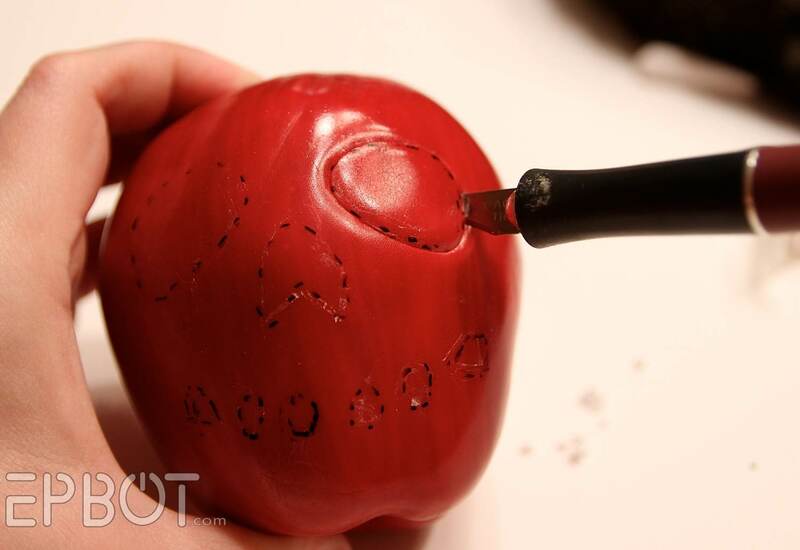 Instead of painting around the eyes, you could also dip the carved apple in glossy green paint and let it drip. 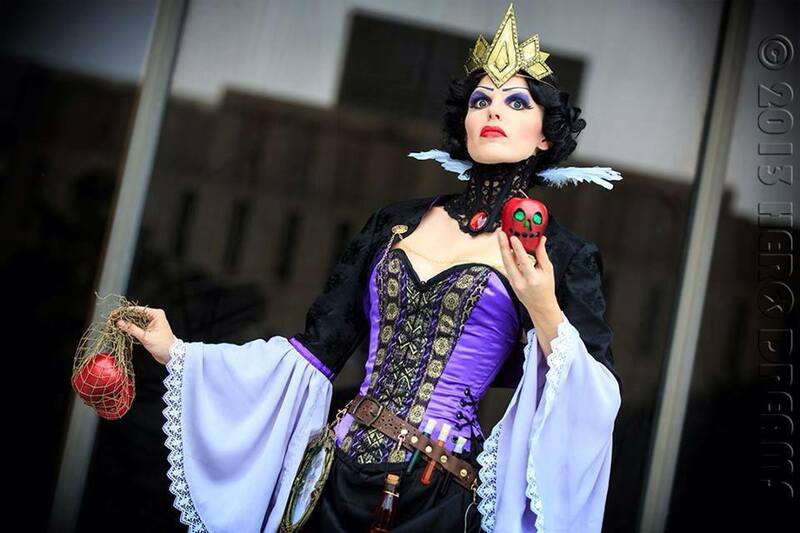 I think I'm going to do this with a plastic skull for my 17 year old's Morgan Le Fay costume. It can be on her scepter. I might paint the outside with clear glow in the dark paint for a softer glow than on the inside. You have me brainstorming now! My 6 year old is going to be King Arthur, my 2 year old a dragon, and I'm Lady Merlin. My husband is going as a party pooper.